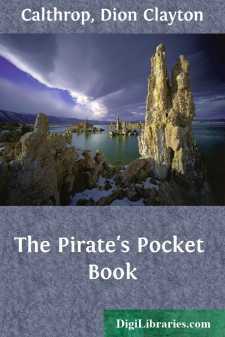 This book you hold in your hand belonged once to a very celebrated Pirate. He was so celebrated that the newspapers—of that time—always said nice things about him, and always knew what he was doing before he did himself. As he was a very truthful man, he did the things, so that the editors might not get into trouble. By which I do not mean that he was always kind. Map of Tomb's Island(very exciting). Nobody knew how old he was. Some said that he was so old that he had never been born. Some said that he must be young or he could not be so wicked. So you see there were two opinions about him. There are always two opinions about a celebrated man. If you look at him you will see that he dressed to please himself. Supposed birthplace of Tombfamily. Family of Bone stillliving in the cottage. He wore a nice hat—but you have noticed that; and he had a roving eye. By which I do not mean his eye walked about like this, but that he looked around him a good deal. If you are thinking of becoming a Pirate—and there is plenty of room at the top of every profession—you will have to look about a good deal, because you will have enemies. He dreams of other worlds to conquer. Tom Tomb—that was not his name, but it was the way he signed other people's cheques, and your father and mother will tell you that this is a very mean trick—lived partly on an island, and partly on board the Inky Murk. You will understand that I mean not with one foot on the island and one on the boat, but sometimes on one and sometimes on the other. Now T. T. never robbed the poor. Because it was not worth his while. But any person who looked rich suffered accordingly. The Inky Murk was the name of his boat. You can make one curiously like it with two chairs and a rug. One day Tomb captured a young fellow—a very handsome lad too. It was off a certain island where Tom Tomb had a neat cottage, in the garden of which he grew flowers for a pastime. Because, of course, he needed a little time to himself in between his tremendous fights. The young fellow was stealing flowers. He was surprised to see Captain Tomb. When I say he was surprised, you will see what I mean by the picture. "What cinderadustmat do you mean," yelled Tomb, in a voice like a railway accident, "by stealing my flowers?" "I thought they were wild," said the young fellow, taking his pipe from his mouth. "Wild!" shrieked Tomb. "Wild!!" he bawled. This last yell was so powerful that three of his buttons flew off his coat. The young fellow caught them neatly in his left hand, and presented them to the Captain on bended knee. The neat act saved the lad's life. "An honour to serve you, Captain Thomas Tomb," said he. "You know me?" asked Tomb, smiling upon the boy. "I thought it must be your face," said the lad boldly. He was about to speak again, had not Tomb silenced him with a gesture. He liked the lad.